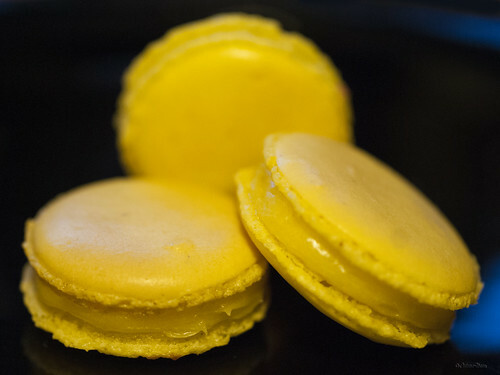 Lemon macaron with lemon curd filling | SMØRGÅSBORD! In a large bowl, beat the egg whites using an electric mixer, starting at medium speed. When the mixture starts becoming frothy and opaque, turn the setting to high speed. Gradually add the caster sugar, beating continuously, until the mixture forms a meringue (becomes glossy and forms soft peaks). Add the flavor essence and gel food coloring, then continue beating until the color becomes homogenous. In a bowl, beat the egg yolks with the caster sugar at high speed until the mixture becomes fluffy and lemon-colored. Pour into a saucepan, add the rest of ingredients except the butter, and heat over medium heat, stirring constantly. When the mixture starts to become somewhat creamy, stir in the butter. Continue stirring until everything is thoroughly combined. Remove from the heat and let cool in the refrigerator before using on the macarons.